Did she let you want when you could not ask? And He knows, too, the limits of poor weak dust. For His chosen ones in that midnight tryst. From A GRACE DISGUISED: HOW THE SOUL GROWS THROUGH LOSS by Jerry Sittser who lost his wife, 4 year old daughter and his mother in a car accident. “Loss creates a barren present, as if one were sailing on a vast sea of nothingness. Those who suffer loss live suspended between the past for which they long and a future for which they hope. They want to return to the harbor of the familiar past and recover what was lost. Or they want to sail on and discover a meaningful future that promises to bring them life again. Instead, they find themselves living in a barren present that is empty of meaning. Memories of the past only remind them of what they have lost; hope for the future only taunts them with an unknown too remote even to imagine. Memories of the past do bring joy, but it takes time for memories to comfort rather than torment. But in coming to the end of ourselves, we can also come to the beginning of a vital relationship with God. Our failures can lead us to grace and to a profound spiritual awakening. This process occurs frequently with those who suffer loss. It often begins when we face our own weaknesses and realize how much we take favorable circumstances for granted. When loss deprives us of those circumstances, our anger, depression, and ingratitude expose the true state of our souls, showing us how small we really are. We see that our identity is largely external, not internal. From A GRACE DISGUISED: HOW THE SOUL GROWS THROUGH LOSS by Jerry Sittser who lost his wife, 4 year old daughter, and his mother in a car accident. “…..Though I experienced death, I also experienced life in ways that I never thought possible before—not after the darkness, as we might supposed but in the darkness. I did not go through pain and come out the other side; instead, I lived in it and found within that pain the grace to survive and eventually grow. I did not get over the loss of my loved ones; rather I absorbed the loss into my life, like soil receives decaying matter, until it became a part of who I am. Sorrow took up permanent residence in my soul and enlarged it. Another new year. I find it amazing that I have been able to live without my husband for a little over three years now when in 36+ years of marriage we had never been apart for any longer than a week. I have to give God all the credit because without Him in my life, I could not have survived and for this long. For a very long time I struggled to figure out what my purpose is in this life now. 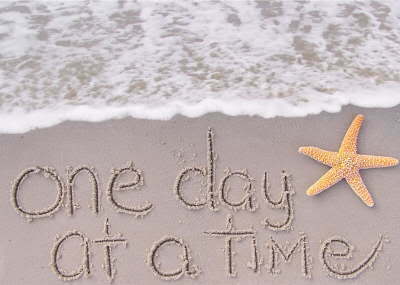 I found it very frustrating and after a time, I decided that for me, it is best to simply take life one day at a time and not worry about “trying” to set goals and get my life as a widow neatly arranged. Each day brings its challenges. Some days are easier than others. 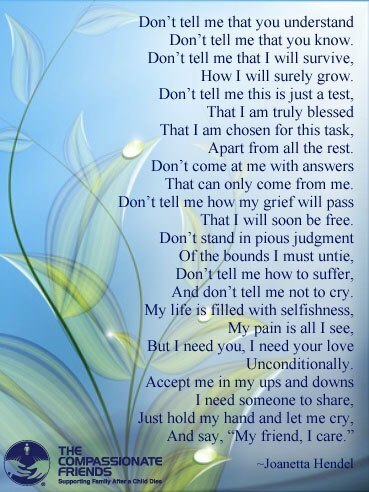 Some days are more emotional with grief triggers that still come out of nowhere.